Guest Post: by Bill Van Geest. Since I read this book a long time ago and Bill read it more recently, he kindly agreed to write a guest post. I would describe Bill as an avid reader with a great perspective on many things. Thanks Bill! 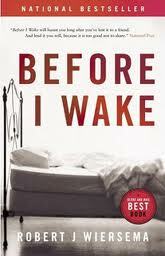 In “Before I Wake” Robert Wiersema takes a story of ordinary people responding to a tragedy in their lives and turns it into an extraordinary story with a cosmic stage setting. Wiersema’s ‘stage’ is somewhat reminiscent of a C.S.Lewis story: the normally visible world exists in front of the curtain and the world behind the curtain is experienced only by some of the characters. The two worlds are woven together throughout the book. In the end, it is a story of unexpected miracles. The book begins with three-year-old Sherry Bennett falling into a coma after being hit by a truck while walking with her mother. They hope against hope for a miracle. Her parents’ marriage has been disintegrating and Sherry’s state appears to make the separation between the couple complete. Wiersema brings in character after character—each speaking in the first person, and recounting events from their own perspective. Some tell the story from one side of the curtain, some from the other. We hear from Sherry’s father, mother, father’s girlfriend, the truck driver, Sherry’s caregiver and several priests—one false and one true—each with their own response to the tragedy of Sherry’s accident. Some reveal a selfless love and care through their responses while others use the event to battle their own demons; several even to inflict their own demons on others. A miracle does occur, followed by many others, but not the one which Sherry’s parents had hoped for. Each character responds to the miracles in his or her own way. However much each character responds to the tragedy, the healings appear to flow from a still deeper source than the intent of the characters. I enjoyed the book as a good story, but also for its boldness and its strangely satisfying conclusion. The author’s willingness to challenge our assumptions about the way the world works drew me into the story. Wiersema has not written a morality play. He draws no conclusions philosophically or spiritually, leaving each of the characters to explain their own realities. This entry was posted in Four Star and tagged Before I Wake, miracles, Robert J. Wiersema. Bookmark the permalink.